Self-esteem is vitally important in the development of children, but it is not about making children feel good at any cost. Some people will go out of their way to ensure children that they are the best, the brightest, the most athletic, etc. Children will then grow up having an exaggerated sense of self that will make it extremely difficult for them to integrate into the real world. What is healthy self-esteem? A sense of confidence in ones own abilities, and decision making skills. Positive experiences and constructive criticism help children to feel good "inside" where it counts instead of looking for outside factors to provide that feeling. Children with low self-esteem will typically show certain behavior traits. They may be impulsive, blame others, have low frustration levels, have an inability to see their own talents and abilities, may set unrealistic goals for themselves, and can be more easily influenced by others and be more likely to adopt destructive behaviors. On the other hand, children with healthy self-esteem typically act in the exact opposite way. They tend to take pride in their accomplishments, will readily accept challenges and new tasks, are able to handle both positive and negative emotions, and are able to act independently. Clearly, you want to help the children in your care to be in the group that feels good about themselves. 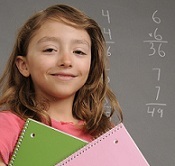 There are several ways to help promote healthy self-esteem in children. Start first by using positive praise. All children like to hear good things said about them. All parents and daycare providers at times focus on the negative behavior of children instead of the positive. What you cannot do is beat yourself up for having a bad day. Move forward and do the best you can. When praising children, the most important thing to remember is to be sincere. Use praise when praise is truly warranted. Praising children when they do not truly deserve it causes them to mistrust us later when the praise is sincere. Children (even very small ones) know when they deserve it. Use praise when a child worked hard to succeed at something, if a child is following the rules, or if they really tried hard to do something, even if it was not accomplished. True praise will lift a child's self-esteem. Help children to change any inaccurate beliefs they have. What if, for example, you are coloring with a group of children and one of them suddenly crumples up the paper claiming, "I'm no good at drawing"? You have several options. First, un-crumple the paper to get an idea of why they feel that way. Look at the drawing carefully to see if you can truly praise any part of it. If the house is all lopsided but the trees are amazing, mention the trees. If everything is goofy looking but there is good color combos, mention that. Maybe they just need some help to understand how to draw a house that's not lopsided. Maybe abstract art is something they would excel at. All children are not gifted in art, but there is usually some part of it that they do well. Look for the ways to make the child feel competent for the things they really are capable of. Pointing out what they do well encourages them to focus on their own strengths. An added note here: If you are not exceptional in art, now would be a good time to share that with a child. Let them know that just because you are not gifted in one area does not mean that you can’t still have fun trying and that you do excel in other areas. This will, in turn, help children to feel good about themselves when they can do something well. And, in the process, help their self-esteem to stay healthy when they are not gifted in a particular area. Even children of the same age will develop at different rates. Catch children doing something right. This is a simple way to build healthy self-esteem. The more you look around and watch children, the more you will see them behaving in ways that you can praise. Give yourself a challenge. Attempt for an entire day, or a week, that you will go out of your way to find children behaving in ways that you can praise. As much as possible ignore all negative behavior. Make sure you give praise when praise is due. I can all but guarantee that by the end of the day or week, you'll have children clamoring to get that kind of attention from you. Just make sure you keep the praise low key. 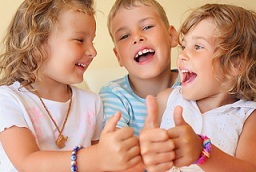 A hand placed on the shoulder and a simple “good job” is enough to see more positive behavior. Maintain eye contact when talking to a child. Looking children in the eye when communicating with them will give them a sense of being important to you. Not looking at them can cause a child to feel they are not important. Think about this one, it works the same way with adults. Be positive and confident yourself. Children learn so much from watching you. Use words that are helpful and not harmful. If a child follows the rules, saying "I like that you did that" will go a lot farther than "Well, I didn't have to remind you for once." Choose words that are constructive. Help children to help themselves. Should a child be in a frustrating position, help them to help themselves. Talk to them about how the problem can be remedied. As much as you possibly can, let children work out issues involving other children by themselves. You can help a child to become independent if you make a point of not solving their problems for them. Make sure your expectations of children are reasonable. Help them to learn that mistakes can be learned from, and that everyone makes them. Read a book where the main character is having a problem. Once the problem has been established in the book, stop reading. Take this time to let the children figure out how the problem should be solved. When they have come up with a good solution, finish reading the book. Sometimes the children will come up with the actual ending on their own, other times they will come up with another good solution for the same problem. Any type of dramatic play will help children to use both their imaginations and what they have seen in real life situations during play. This type of play allows children to try out different “places and faces” in a child friendly environment. The needs of a whole group must be met, therefore children learn cooperation, sharing, and social skills. Cooking with children gives them the opportunity to complete a project in a short amount of time. Everything from gathering ingredients, to measuring, mixing, cooking, and (best of all) tasting will help children develop confidence in their own abilities. Looking for a game to promote healthy self-esteem? Playing "What if" helps children to role play prior to being in a real life situation. It allows them to practice ahead of time and will help them to make better choices. Learning problem solving skills early on will lead to life long acceptance of their own capabilities when confronted with real problems. The essence of the game is easy. Ask questions that require answers. Give an imaginary problem and ask the child how they would solve the problem. They may give a good answer immediately. If not, ask them to expand on the answer until a good solution is found. Help only as much as is necessary, for the most part, let the child find the answer on their own. What if you accidentally hurt someone? What if you are invited to someone’s home for dinner and you don't like the meal that is served? What if you hurt someone in the past and now they don't want to play with you? What if another child is already playing with a toy you want to play with? What if another child takes a toy away from you? What if someone makes fun of the shirt (or coat, hat, shoes) you are wearing? What if you get a homework assignment you don't understand? What if you wanted to make a bird house but you didn't have any wood? What if you were invited to a birthday party, but didn't have enough money for a present? Depending on the situations involving the children in your care, the questions can be worded in any way to help children think for themselves. The more they are able to come up with solutions on their own, the more self-confident they are going to feel.